Last year, astrophysicist Jay Farihi discovered possible evidence of an exoplanet on a photographic glass plate taken in 1917. A researcher accidentally uncovered photographic evidence of an exoplanet that was unknowingly detected a hundred years ago. At the beginning of the 20th century, the existence of exoplanets was theorized, but detecting planets much smaller than their home star remained an extremely difficult task with the tools of the day. In fact, it was only in the 1980s that the search for planetary systems orbiting stars outside the solar system became a subject of scientific research. We had to wait for technology to catch up in the 1990s before the first exoplanet was truly identified. Yet, new research suggests the first ever recorded evidence of the existence of exoplanets dates all the way back to 1917. Back in 1995, Swiss astronomers Michel Mayor and Didier Queloz discovered 51 Pegasi b (aka Dimidium), confirming that Earth-like planets could exist outside our solar system. Since then, the hunt for extrasolar planets has been ongoing, and thousands of planets orbiting their stars have been discovered. Read more about exoplanets we’ve discovered here. And, after exoplanets, the Kepler mission team, using the same periodic dimming detection technique, have potentially discovered the first ever exomoon: a moon orbiting an exoplanet. Hunting exoplanets goes a long way in helping us answer maybe the biggest existential question of the humankind: Are we alone? To our knowledge, no life, even in its most basic forms, has been detected on any other celestial body other than Earth. Earth, fine-tuned to host life, is unique–until proven otherwise. Among thousands of discovered exoplanets, NASA’s Kepler mission has confirmed that at least 30 potentially Earth-like exoplanets are located in the habitable zone of their star. Despite that, we still can’t get close enough to actually see any of these exoplanets. A private mission, called Project Blue, aims to take the first direct picture of an exoplanet in the Alpha Centauri star system, using a telescope in low Earth orbit. 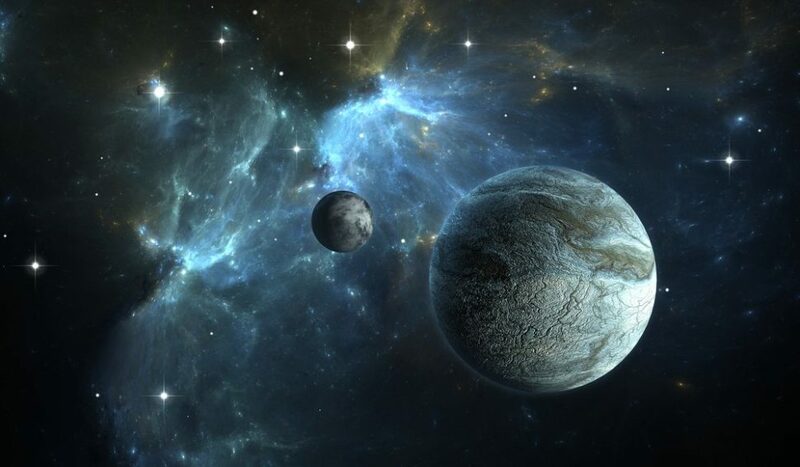 Project Blue was initiated by BoldlyGo Institute, backed by a consortium of leading research organizations such as the SETI Institute, the University of Massachusetts Lowell, Mission Centaur, and even public support. While Project Blue will perhaps give us our first direct image of an Earth-like planet, it’s been a long time coming, as the first-ever photographic evidence of an alien planetary system was caught a century ago. Last year, astrophysicist and review author Jay Farihi of University College London contacted the Carnegie Observatories asking for a photographic plate from 1917 to write a scientific review. In those days when digital instruments were not available, astronomers used glass photographic plates to record stellar spectra (light emitted by stars), to study the chemical composition of distant stars and classify them. This old glass photographic plate, exhumed from the Carnegie Observatories’ Collection at Farihi’s request, records the spectrum of the star van Maanen (a white dwarf star), discovered by astronomer Adriaan van Maanen this very year. The plate was made by Walter Adams, a former Observatories Director. Aside from noting that the star looked warmer than our Sun, nothing unusual was reported back then. However, when Farihi inspected the spectrum on the plate, he was surprised to find two of what’s known as “absorption lines”, indicating the presence of heavy elements such as iron, calcium, and magnesium on the surface or in the immediate vicinity of the star. White dwarfs are very old stars in their final stages of “life”. Their spectra usually are pure and composed only of light elements. It is only in the last 12 years, using state-of-the-art space telescopes, that “polluted” white dwarfs, as astronomers call them, were discovered in big numbers. These spectra displaying heavy elements represent stars surrounded by large rings composed of planetary debris and, for some, whole planetary systems, though none has been thoroughly identified. Despite that, Carnegie has a large archive of astronomical plate collections (over 250,000 plates), so who knows what other surprises are waiting to be uncovered? A detailed article on the findings was published by Farihi in the New Astronomy Reviews journal. What else could be hiding in the Carnegie Observatories? Anyone else having a Library of Alexandria moment?